I love eggplant too. Sometimes I just sprinkle the slices with Cajun seasoning and bake. Then I use them for sandwiches or snacks. Yum. Yum. Honestly, you still had a good day. You didn't go for the take-out food or munch on potato chips. You're allowed to have a day or two like that, you know? I understand how easily it is to slip back into old habits, but you've got this down and I know you wouldn't let that happen. You've come too far. And you know that, too. That's why you still ate well and still busted your hump on the next sunny day. I'm not a fan of the weather here to be honest. It rains too much and isn't warm enough. Still, we've had a crazy mild winter this year so I guess I can't complain. When I lived in Texas, I loved to have bad weather parties. We "partied" through every hurricane/tropical storm that hit while I lived in Houston, including Ike. This typically involved pitchers of hurricane and Scrabble games that devolved into only being able to use cuss words. If the weather wasn't actually bad, we'd head to the deserted bars downtown and celebrate finding parking and plenty of elbow room. I do sometimes love a snuggled on the couch bad weather day. And your eggplant looks phenomenal! I'll have to keep that one in my back pocket for when hubby is out of town (dratted man hates eggplant). Aubergine is something I like but always forget about buying it. I guess I don't know enough recipes to cook stuff with it but I will have to try and remember to print your ones off and give them a go. Occasionally we need a down day. It is good for body and mind if it is a rare treat. 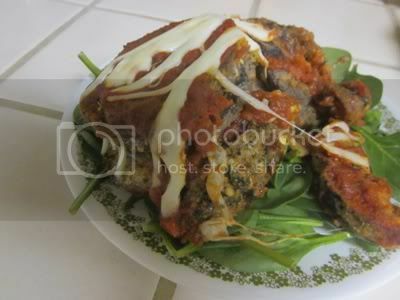 I've never tried eggplant parmegiana, I see it all the time but its just not a recipe people eat here (NZ). Perhaps I need to use your recipe and give it a go. Mmm! I love eggplant parm so I'm definitely going to have to try this one. It snowed here on Saturday so I sadly spent most of the day on the couch. i tend to TRY and catch up on blogs (mine and my friends including yours! ) read, do my weekly shopping/laundry/cleaning, spend some extra time playing with divonna (my chihuahua aka as a princess in canine form!) go out with friends etc etc if i'm lucky i can play wow for an hour or watch a movie. the last few weeks i've been in purge mode. i got rid of over 1oo books (a HUGE deal for me) lots of old fat clothes, cds, shoot even dumped 50 fb "friends" . trying to simplify. today i've got 2 boxes of books to donate to goodwill, and a box of cds to trade in at fye. Holy Batman, this looks good!!! I LOVE eggplant as well, but don't make it nearly enough as I should. Thanks for another inspiring recipe. oh my god , yum!!! that looks awesome!! I love to watch movies or read a book on rainy days - I love rainy days! Thanks for sharing the recipe! I'll be trying it this week! When you posted about stuffed green peppers a few months ago, I thought, "Wow, what a great idea!" and went on a stuffed green pepper bender for a few weeks. Even though I'd never made them before. So now I'm gonna try these!